The UK Home Office feels it is absolutely the organisation to fulfill this role. It also apparently feels there are certain opinions that you are far better never hearing. Like those of Lauren Southern, who on the 12th of March was “banned for life” from entering the United Kingdom, after being detained under Schedule 7 of the Terrorism Act (2000). Southern was told that “by her own admission” she had distributed “racist material.” It is important to note that actually, Southern, however, did not at all admit to the material being distributed being “racist” in nature, she simply admitted to distributing it. But she, of course, was forbidden to dispute whether her material was truly racist, the mere suggestion that Southern was racist proved ample enough for her right to speak freely being expunged. What material led to Southern being banned from entering the United Kingdom? A UK Home Office official explained that Southern was “refused [entry] on policy grounds that their presence in the UK was not conducive to the public good.” It leaves anyone who believes in free discourse, without the trappings of state oversight with the question: Should the state really be the arbiter of what is “conducive” to the public good? No, is the answer most sensible individuals will conclude. You may like the idea of a state you agree with having this power, but what happens when it becomes a state you disagree with? This decision is far better left to the people of the United Kingdom and any other nation. 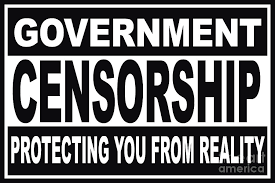 But this isn’t just censorship, this is using the potent force of counter-terrorism legislation to silence. An examination is needed. We must inspect the alleged possible ways in which Miss Southern could potentially have posed a terrorist threat and breached the Terrorism Act of (2000). Southern was served a notice that she was detained under counter-terrorism laws, specifically under Schedule 7 of the Terrorism Act (2000). A reminder: when detained under this serious counter-terrorism tool, it is a serious offence to remain silent. Does this really seem like a fitting use of counter-terrorism legislation when we have IS fighters returning in their 100s to the UK? Only 54 of said fighters have even been prosecuted. The alleged breach of Schedule 7 is not made perfectly clear in the dubious material handed to Southern, although the official Home Office notice claims that “distribution of racist material” in Luton was enough to warrant a refusal of entry. Oh dear. Quelle horreur! How will the omnipotent Allah recover from such a “sick burn.” It appears the state is now censoring individuals who dared have the audacity to offend Islam by saying something mischievous! OK Magazine will be asking: How will Islam cope? Oprah may give Allah a tearful interview. But on a more serious note: should the UK Border Force really be trying to enforce Islamic blasphemy laws? We have enough regressive Islamists constantly asserting to suggest who we can and cannot criticise, and intimidating those who do dare to criticise Islam a little more forcefully. Do we really need our state joining in? Voltaire once noted: "To learn who rules over you, simply find out who you are not allowed to criticize.” Islamic theology, it seems, is off limits to rational thinkers. Regardless, consider what is so offensive about calling Allah gay? Unless, Islamic individuals would have a problem with Allah being homosexual?Could that be down to regressive opinions and intolerance of homosexuality amongst Islamic individuals? True, perhaps Southern’s leaflet is not the sharpest or most intelligent criticism of Islam, and it certainly won’t mortally wound Allah, even if his acolytes seem to think so, but should the UK Government now in the role of policing criticisms of Islam? This is the next logical step. The UK Government now seems to be the theological arbiter of what is acceptable when criticising Allah. Interestingly, this doesn’t seem to have been an offence that has previously seen arrests, or even action taken. Or even been illegal. The Council of Ex-Muslims of Great Britain at the 2017 London Pride Parade held placards inscribed with the apparently deeply damaging slogan “Allah is Gay.” Despite outrage from the East London mosque who felt this was Islamophobic, no police action was taken. So how can it be a terrorist offence for an individual to distribute material with this opinion when others can march with it on placards? The implementation of the law here, at best, seems inconsistent. It seems like all individuals have free speech, but certain individuals have more free speech than others. Surely, calling Allah a “gay god,” a theological and not racial criticism, is not enough to merit detention of Southern alone? So, an important question is what other parts of the Terrorism Act (2000) would merit the detention of and refusal of entry for Southern? Section 11 notes that “A person commits an offence if he belongs or professes to belong to a proscribed organisation.” Lauren Southern obviously does not belong to any proscribed terrorist organisation, so this ground for arrest can be swiftly ruled out. Lauren Southern, if anything, has repeatedly criticised terrorist organisations, and fought to defend those who have been censored for doing so and brought attention to actions of these organisations and human rights abuses. You may disagree with her politics and find her even personally repugnant, but she has not engaged in support for international or national terrorism. Section 12 of the Terrorism Act (2000) notes: “A person commits an offence if— (a) he invites support for a proscribed organisation,” which clearly does not apply to Southern. She does not support any organisation that could be considered terrorist in nature, the opposite would seem to be true. This charge can also be dismissed out of hand. Again, there seems to be no evidence that Lauren Southern supports or has supported any organisation on the UK’s proscribed list of organisations. There is additionally no evidence that Lauren Southern was planned to meet any terrorist organisation. Regardless, alarm bells of hypocrisy should be overwhelming, if not certainly ringing, dear reader. What about the Al-Quds rally in London, where thousands rallied, flying flags of a terrorist organisation and making spurious allegations about the Jews? This author isn’t recommending these people be prosecuted, but recommends that if one can stand with terrorist material promoting anti-Semitic conspiracies in British streets with police protection, someone who called Allah “Gay” in a leaflet should be able to enter the country. Furthermore, returning to Section 13 of the Terrorism Act (2000), which declares: “A person in a public place commits an offence if he (a)wears an item of clothing, or (b)wears, carries or displays an article, in such a way or in such circumstances as to arouse reasonable suspicion that he is a member or supporter of a proscribed organisation,” we see more of this blatant inconsistency. Again, Southern has not been charged for her clothing or for wearing the insignia of any terrorist organisation? Even if one argues that her leaflets were “offensive,” they were not in support of terrorism or emblazoned with such insignia. Sections 15 and 18 of the Terrorism Act (2000) pertain to the other possible offences, that are “fund-raising” and “money laundering,” of which it is perfectly clear did not justify Southern’s Schedule 7 detention, and Southern is not guilty of. What appears to be the case is that Southern was arrested, detained and refused entrance to the United Kingdom because her political opinions were deemed to be a little too inappropriate and obviously exceedingly dangerous… for British people to hear. Silencing the opposition isn’t a sign of strength, and it is a sign of weakness and ultimately totalitarianism. If the Home Office's ideas of stability can stand the test of time and fierce logical criticisms, then they can stand a moderately famous blonde youtuber and her critiques. Sadly, the Southern incident is one of many, in which individuals who have been deemed to have thought “wrongly” have been detained, and their ability to enter or leave the UK restricted. Activists Brittany Pettibone and Austrian politician Martin Sellner have also been detained for a period of 3 days and then deported from the United Kingdom. Pettibone’s offence was arranging to interview Tommy Robinson, former leader of the English Defence League. Her crime was going to be interviewing a man who holds opinions that are unfashionable. It was not even her own opinions that saw Pettibone deported, but her daring to possibly inquire about, challenge and probe those of another person. Regardless of what you think of Robinson, or Pettibone, should another individual be held accountable for asking him about his opinions? This censorship would fit well in the world of Orwell’s 1984. Generation Identity, which Selner allegedly belongs to, is not a proscribed organisation under existing counter-terrorism laws, but it is apparently too dangerous for you to hear from. They do not seem to advocate violence or promote terrorism, even if you have disagreement with their political goals. Believing that immigration should be restricted, a legitimate policy opinion, is now enough to see you rejected from entering the United Kingdom? This is a legitimate policy concern, which polling appears to vindicate, as it suggests that 7 in 10 Brits want reductions in immigration. But apparently wanting to promote this, in a peaceful manner through demonstrations including displaying non-violent banners, is to be deemed enough to see you rejected entry from the UK. You may not agree with a single one of these individuals or their politics, and that is well within your right to do so. You do not have to like or laud them, or view them as particularly helpful, but what you should support is the individual citizen’s ability to decide whether they agree with you. And their freedom to make a case without state intervention. Orwell warned us about the dangers of policing what is and isn’t acceptable. In effectively censoring these individuals, the UK Home Office has decided that you cannot be trusted to make up your own opinion, and that it should decide for you. And that should be enough to terrify any individual who thinks all in our society must have the fundamental right to unfettered discourse.